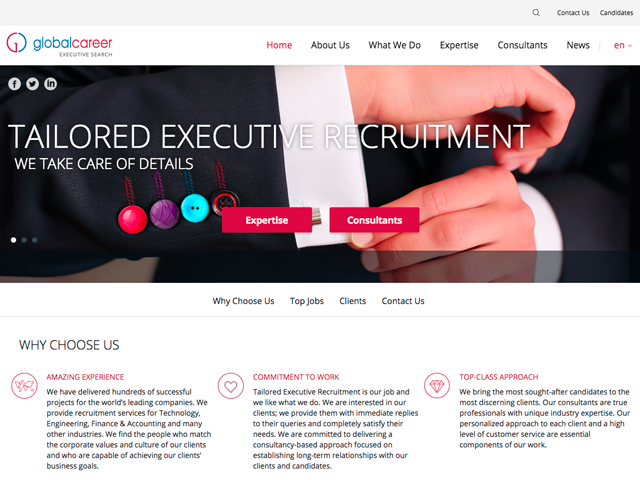 GlobalCareer is a boutique Executive Search firm specializing in the technology driven industries. GlobalCareer is part of Luxoft Group, a leading international provider of IT services and high technology business solutions worldwide. The vision of our business is to be the key provider of executive management selection services for technology driven business, so that we maintain our clients’ competitive advantages in the ever changing world. Established in 2008, GlobalCareer operates in MEE, APAC and North America at 5 offices in 4 countries. GlobalCareer is a multicultural business, with a multicultural client base: Luxoft, Kaspersky, Aveva, KPMG, Accenture, Harman, UBS, etc.